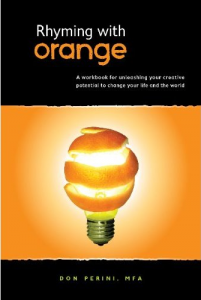 Rhyming with Orange answers those questions and more in this easy-to-read, interactive book that will encourage you to develop dozens of creative habits leading to countless creative endeavors that will change your life and the world. Slay your time vampires – Time slips away so quickly if we don’t stay on top of it. Identify the things that steal your time, and eliminate them. Learn the habits of other creative people and imitate them – You don’t have to become a clone of someone else, but we can learn a lot from other successful and creative people, and adapt some of their habits for our use. Design your environment to inspire you to do extraordinary things. Set up your work space or home with things that will inspire you to be creative. You might include fun stuff like Play-Doh, Lego, Dr. Suess books, lava lamps, paper and colored pencils or crayons, etc. Allow yourself to be messy. Many times, we don’t get started on a project because we want it to be perfect…and so we end up never starting at all. So don’t worry how pretty things look at the beginning. Just get started, and you can make changes, edit, or clean it up later. Plan time to be creative. Make an appointment with yourself every day to think of new ideas or solutions to problems. Figure out your “idea-friendly time” – When are you the most creative? When is your mind the most open to new ideas? For some, it is morning. For others, it might be late at night. And of course, for others, it is sometime in between! Create your failure resume – Make a list of all the things you’ve tried that didn’t work. Why focus on your failures? Because if we don’t think about and analyze our failures, we can’t fully learn from them. And, by identifying the things that don’t work, we often discover more new ways of doing things. I used to think I was not a creative person because I’m not a musician or artist. But over the years, I’ve become a writer (which requires creativity) and I’ve gained a greater appreciation for art and music. I really want to unleash the creativity in my life and in the lives of my children, to help equip them to handle any situation they face in life and achieve their goals and dreams. What about you? Are you a creative person? Do you see the value of unleashing your creativity to help you change your life and world? Very interesting article, Rich. I need to get this book. I wonder if Mr. Perini endorses the Design Thinking methodology as well? I like the orange concept (from title) because you can’t just start with orange. Orange is not a primary color… but red and yellow ARE. My gut tells me the orange analogy has something to do with combining the mind (yellow) with the heart (red) of an idea. Just a suspicion. The best ideas leverage both Left and Right brain thinking. Logic and intuition. Data and feelings.